The global water cycle depicted in Figure 2.2 emphasizes the importance of the transfer of atmospheric moisture from sea to land. Oceans receive 79% of global precipitation and contribute 88% of global ET (Dingman 2002). Precipitation on the earth's land surfaces exceeds ET by 40,000 km3, and this is balanced by an equal amount that is runoff from land to sea. The annual runoff of 40,000 km3 is the total amount of water potentially available for all human uses, including drinking and other municipal needs, for industry, and for irrigated agriculture (non-irrigated agriculture is fed by rain and returns most of this water to the atmosphere as ET over land). However, only about 12, 500km3 of runoff is truly accessible, because the majority occurs in lightly populated areas or in seasonal floods that are only partly captured (Postel et al. 1996). Runoff includes both surface flow and ground-water outflow, but the latter is usually small and unmeasured, and so the two terms are not always distinguished in common use. If groundwater inflows and outflows are roughly in balance or small enough to ignore, then precipitation leaves the system as stream-flow and ET. 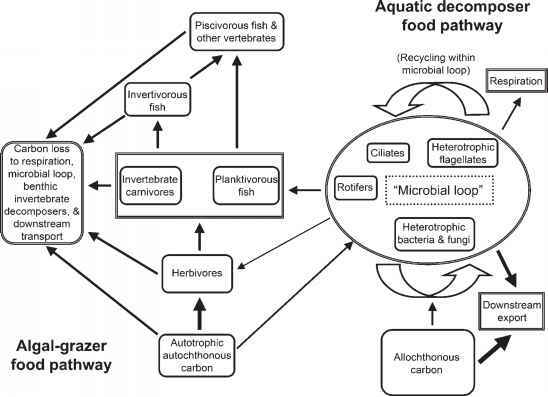 These terms vary both spatially and temporally, and thus are primarily responsible for the variability in streamflow that we shall discuss at length later in this chapter. First, it will be helpful to describe each term in more detail. Precipitation includes rain and snow. Its rate varies more on hourly and daily timescales than over months or years, and we are all familiar with patterns in the average values of the latter, recognized as wet and dry months, and from annual mean values that help define the climate of a region and cause us to remark on unusually wet or dry years. Rain infiltrates the land surface or runs off rapidly, but snow is stored on the earth's surface for hours to months before melting. In many areas snow is the main source of surface water supply and groundwater recharge, and melt water is influential in spring flood cycles and in maintaining summer base flows. In the High Sierras of the western United States, gradual warming since the 1950s has reduced the winter storage of precipitation as ice and snow, and shifted the peak of snowmelt runoff to earlier in the spring (Service 2004). Because winter storage acts as a natural reservoir, melting gradually to provision spring and summer river flows, some have suggested the need for new reservoirs to replace the storage capacity formerly afforded by the snowpack. ET includes all processes by which water at or near the land surface is returned to the atmosphere (Dingman 2002). Mainly, it includes evaporation from land surfaces and water lost by plants during the exchange of carbon dioxide (CO2) and oxygen for photosynthesis. Globally about 62% of precipitation that falls on land becomes ET, and ET exceeds runoff for most rivers and for all continents except Antarctica (Table 2.1). Water loss by plant transpiration constitutes a major flux back to the atmosphere. When an experimental forest in New Hampshire was clear-cut and subsequent regrowth was suppressed with herbicides, stream runoff increased 40% on an annual basis, and 400% during summer (Likens and Bormann 1995). This represented the water that would have returned to the atmosphere primarily via transpiration in an intact forest. Subsequently, when herbicide treatment was suspended, the forest rapidly regenerated with species with high transpiration rates, and streamflow declined to levels below that of the mature forest. Seasonal variation in ET, due to the combined effects of temperature and water demand by plants, often is greater than seasonal variation in precipitation. This can be seen in comparisons of monthly averages for precipitation and runoff for a series of North American rivers (Figure 2.3), in which ET can be inferred as the difference. In Mediterranean climates, both ET and precipitation can show marked seasonal declines during summer months, creating large precipitation deficits that virtually eliminate groundwater recharge and base flow. 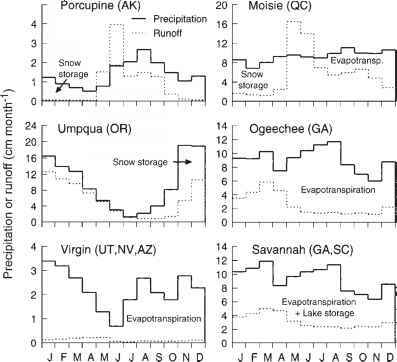 In cold climates ET is reduced and so a larger fraction of precipitation leaves the catchment as runoff, as Figure 2.4 illustrates for rivers along the Atlantic Coast from Canada to the southeastern United States.